How about this for a celebrity endorsement? 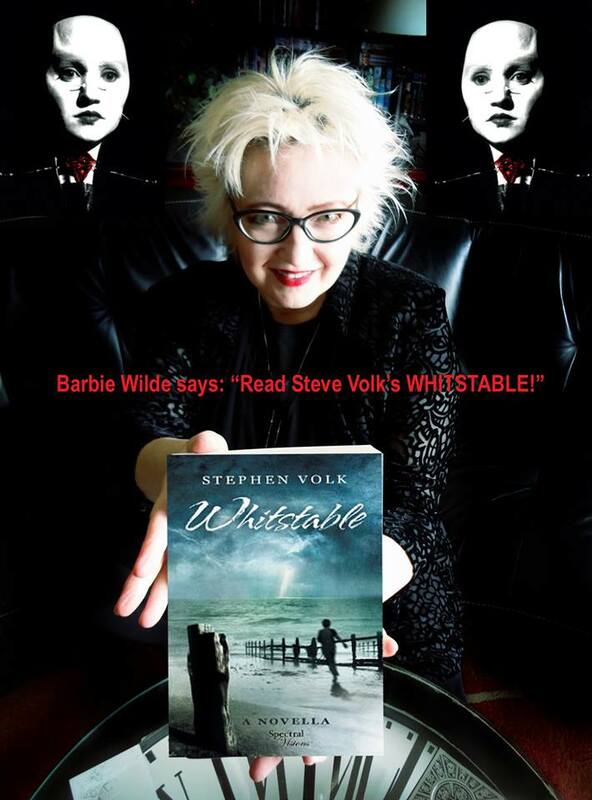 This is our good friend Barbie Wilde, who should be known to all horror aficionados as the actress who played the Female Cenobite in Hellbound: Hellraiser II and is also an author in her own right (we thoroughly recommend her novel The Venus Complex), and here she is encouraging you all to go out and buy a copy of Stephen Volk’s Whitstable, if you haven’t done so already. She bought it, and the first thing we knew about it was when she posted a status on Facebook to say how much she loved it. Now, you really don’t want the Female Cenobite to haunt your nightmares, do you? We suggest you follow her lead and buy a copy today. Thanks to Stanley for such a brilliant review – please note, however, that this chapbook is now SOLD OUT! 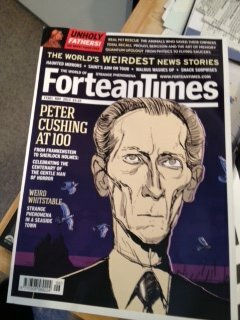 In the same issue, you can also read the latest installment of my Ramblings of a Tattooed Head column. While we were away doing the book launch thing for Whitstable in the seaside town of Whitstable itself, more than a few reviews of Stephen Volk’s novella winged their way into our email inbox. So, this Tuesday morning, please indulge us while we tell you about, and provide links to, them all. First off is This Is Horror‘s assessment, written by Michael Wilson – you can find that one right here. Next up we have a review from Sarah Watkins, posted to her And Then I Read A Book blog – that one is here. 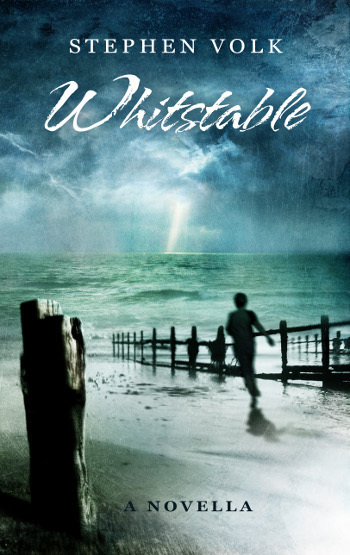 Thirdly, Des Lewis has completed his real-time review of Whitstable and you can read his thoughts about it here. DVD Choices has a very short, but nevertheless sweet, review written by Barry Forshaw here . Here’s one from Mark Gordon Palmer over on the Seat at the Back Cinema Magazine – go here for that one. Keith B. Walters also took a look at the book, and this is what he thought of it. And, finally for Whitstable for now, this is the full SFX Magazine review as written by Ian Berriman, uploaded to their website. You’ll find that one here. Paul Kane’s Creakers also received a new review – this one is from Dread Central and is from the pen of Pestilence. That one is here. “Creakers: They called them that in this trade, or at least he did, is the very sentence that opens this short story by Paul Kane. It’s a line that says a lot about what’s to follow, without giving too much away. It’s a simple phrase that allows the read to draw a small conclusion and have an expectation or two, only for that expectation to be nixed on the very same page – but in a good way. If you’re at all like me, you probably instantly thought that this was going to be a story about a ghost hunter, or some kind of spiritual cleansing; it’s not, not entirely anyway. Ray Johnson is a house flipper. He buys properties, fixes them up and resells them – if you’ve ever spent five minutes watching a home improvement television channel, you know what a house flipper is all about. Nevertheless, the house Ray is working on is particularly special to him for it’s his childhood home. Most memories that stem from a childhood home are sweet and filled with many firsts, parties, and celebrations; but not Ray’s. Growing up under the strict sternness of his mother, and only his mother, Ray never dreamt of returning to the house he grew up in. Not a friendly or cherished memory could be recalled to the forefront, but he also couldn’t let anybody else flip this house after his mother died. He had to man up, something that this story centers a lot on, and get through this. Along the way, Ray meets his mother’s neighbor, where he finds out a lot of interesting, and new information regarding his mother and the relationship she had with her one and only son. Shortly after events within the house become stranger and stranger, and eventually lead to a pretty satisfying ending. Kane’s style of writing is intriguing, and not one I’m accustom to seeing. He seems rushed and frantic, but I feel it adds to the story. There’s not a lot of unneeded fluff added to lend length to the story, which is something a lot of writers do in order to hit a specific word count, but not Paul Kane. Everything that he needs said is indeed said, and he’s still able to tell a compelling narrative. The story itself isn’t anything ground breaking or earth shattering in anyway; it’s a simple tale of one man who’s troubled childhood comes back to him. But it doesn’t have to be more than that. We learn enough about Ray to want him to beat his adversary. We know enough about the house that we want to know how the next chapter in its life will begin. There’s a lot going on in this finely crafted short story, and I would be hard pressed to find something this enjoyable in such a small package any time soon. 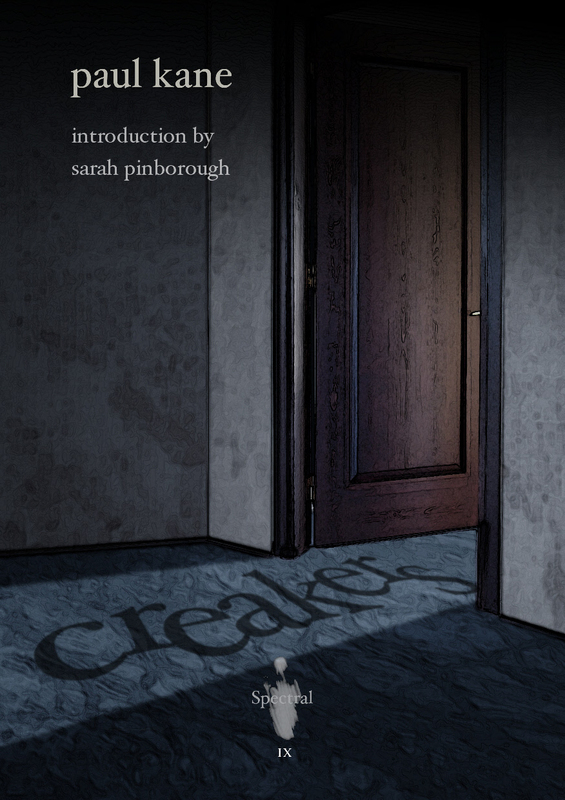 Using great language and description to create a spooky atmosphere, Paul Kane’s Creakers is a must read for anybody, not just fans of horror. The Sanatarium website can be found here. More reviews soon! Two more reviews have reached us, one each for Stephen Volk’s Whitstable and Paul Kane’s Creakers. Taking the Whitstable one first, this one is from Literary Mayhem and has been written by Peter Schwotzer – you can find that one here. 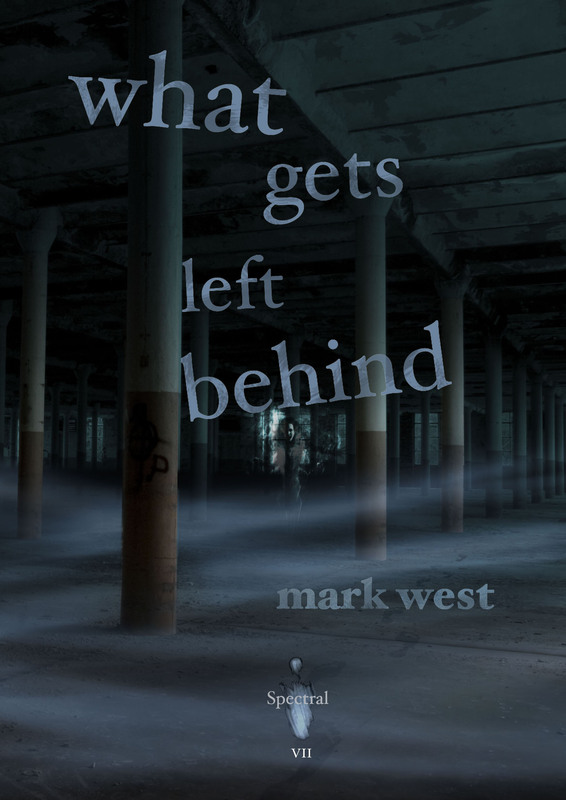 Also, you can now purchase the paperback edition of the book from the Spectral Shop (first option on the above menu bar). And secondly, here’s the review of Creakers – from Gef Fox this time on his Wag the Fox blog site. Just click here. 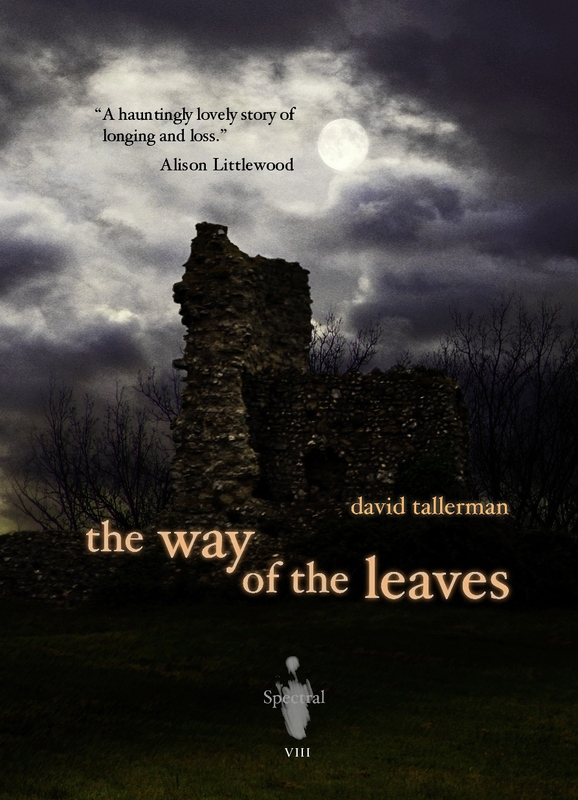 Here we are again with news of a couple of reviews of two of the most recent Spectral chapbooks – David Tallerman’s The Way of the Leaves and Paul Kane’s Creakers. Conveniently they’ve been written by the same person, Matthew Fryer, and have been posted to his Welcome to the Hellforge blog – the write-ups can be read by going here. More soon – onwards and upwards! Today is something of a quiet day here in Spectral Towers, and so here’s a quick link to a new review of Paul Kane’s Creakers – this one’s by Mark West and has been posted to Goodreads. As some of you may remember, Mark is the man responsible for the video book trailers for Spectral. Anyway, enjoy what he has to say about the latest in the chapbook line – you can access it here! There are still copies left of this, but in very limited supply (fewer than 12 copies) – you can buy them individually at £4UK/£7.00EU/$16US/$16RoW OR, even better, take out a subscription to the quarterly chapbooks, which will cost you £16UK/£23.50EU /$45US/ $45US RoW for a year’s worth of issues (4 chapbooks). Visit the Spectral Shop for ordering details!